In general terms, you prepare your system, choose installation options, install the product, and launch it. The SOFiSTiK BIM Products FEA Extension, SOFiCAD Data-Exchange as well as the Rhinoceros Interface are part of the correponding products SOFiSTiK-FEA and SOFiCAD and not available in the Autodesk App Store. After reading the Getting Ready chapter, follow the steps to install your SOFiSTiK BIM Product. If not already done, get familiar with the Autodesk App Store and come back. 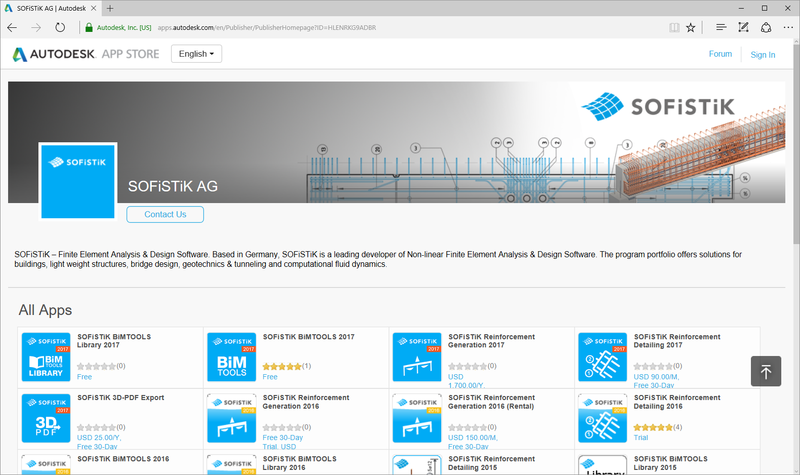 Go to the SOFiSTiK Publisher Page at the Autodesk App Store. Click Sign In in the upper right corner, and sign into your Autodesk account. Click your desired SOFiSTiK BIM Product to go to the product page. Simply click on the blue button that says “Free”, “Trial” or else that lists a price for the App. After the download completes, double-click the file to start the installation process. When you start Revit, your SOFiSTiK BIM Product displays between the Manage tab and the Modify tab. If you encounter problems with the add-in installation, go to the Need Assistance chapter for help. Follow the appropriate link to activate your new installed software. You have subscribed the app or downloaded the 30 Days trial? You have bought the software from your SOFiSTiK Sales partner? Due to continuous development of our programs it might be that newer versions have already been released at the time of your SOFiSTiK Software installation. Follow the steps to update your SOFiSTiK BIM Product. If not already done, check if I you are using the latest program version. Simply click on the blue button that says “Free” or “Download” to start the download. After the download completes, double-click the file to start the update process. Please use the download link in the App descrition in case the App Store button shows “Your trial has expired”. This is a known issues in case you’re using the WIBU-Licensing directly from SOFiSTiK. If you encounter problems with the update process add-in, go to the Need Assistance chapter for help. Follow the steps to check if you there is an update available for your SOFiSTiK BIM App or if you already use the latest version. Go to the Autodesk App Store. Click the drop-down with your Account Name in the upper right corner and select My Downloads. Check the Status of your App. It may happen that your installed version was downloaded from a different account. I this case you have to compare the version number at the product page in the App Store with the version number in the Log File of your software.